Dr. Masis Yeterian’s passion is to design and execute the ultimate smile that will give you confidence both professionally and personally. His ability to reconstruct and restore is based on an in-depth knowledge of dental materials that had been taught to him by both his father and Dr. Sidney Berger. For Dr. Masis and his sisters, dentistry is a family affair. The youngest of 11 children, Masis and three of his sisters were brought into their father's dental lab and taught firsthand by his father what it means to be a ceramist. That experience resulted in one dentist and three dental labs! Dr. Yeterian formerly taught at the New York University College of Dentistry and awarded Fellowship in the International Congress of Oral Implantology. He is an active member of the American Academy of Cosmetic Dentistry, Academy of General Dentistry, the International Congress of Oral Implantology and the Greenwich Study Club. He is currently pursuing his Diplomate status in the ICOI. Dr. Yeterian joined the practice of Dr. Richard Greenberg in January 2005 and relocated to Greenwich in 2008 with his wife, Ludivine, and daughters, Julia and Sasha, enjoying the many benefits the community has to offer. With his wife, he has been involved with fund raising for the "Save the Children" organization. 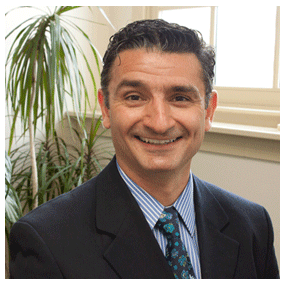 In April 2011, Dr. Masis was appointed staff member at Greenwich Hospital.